A sure sign you'll have a good season is when you hear the creaky songs of male Rufous Songlarks out in the paddock as they fly from tree to tree marking out their new territories. Having just returned from spending the winter somewhere in northern Australia, they sing almost incessantly (listen on sound page) in the hope of attracting a female. In the ensuing season, some males may even mate with up to three females. Male songlarks are considerably larger than females, but the females are the ones that do most of the work - building a nest, incubating the eggs and feeding the young. Males spend a lot of time patrolling their territories and rarely visit the nest. Open woodland with plenty of grass and weedy growth is ideal habitat. The nest is built on the ground, well hidden amongst thick growth and the female is very cautious when going to and fro - she always lands some distance away from the nest and walks in under cover. When sitting on the nest, if the male happens to fly overhead, she answers him with a quiet " tic - tic -tic" call. 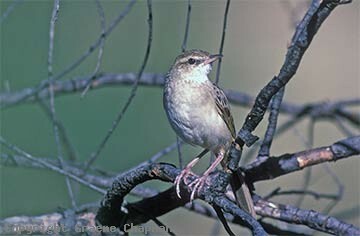 Rufous Songlarks are largely insectivorous and feed mainly on the ground. They seek out the good times and places where growth is prolific and invertebrates abound. They can be confused with female Brown Songlarks and Australian Pipits - the best fieldmark is their rufous rump (see pic 509202). 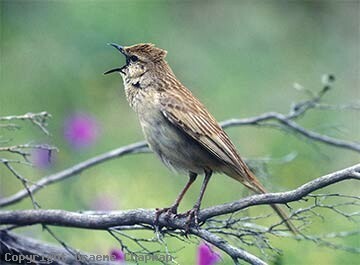 509201 ... Rufous Songlark, male singing. The palate (mouth) is black. 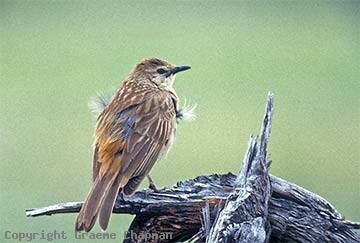 509202 ... Rufous Songlark male. Note the rufous rump. 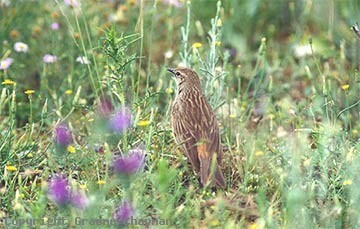 509204 ... Rufous Songlark, female.